5358. Leatha I READEMAN [scrapbook] 1, 2 (Ida Susanne SEIWELL , Mary Catherine RUPERT , Susannah H BITLER , James , John , Johannes ) was born on 11 Jul 1905. She died in Oct 1984. She was buried in Conyngham Union Cemetery, Conyngham, Luzerne Co, PA.
Leatha resided in 1920 in Conyngham, Luzerne Co, PA. She resided in 1930 in Butler Ave, Conyngham, Luzerne Co, PA.
Leatha married Wallace Aaron KISENWETHER [scrapbook] 1, 2, son of William KISENWETHER and Amelia BAER. Wallace was born on 12 Aug 1889/1899 in Sugarloaf Twp, Luzerne Co, PA. He died on 18 Mar 1966 in RD1 Sugarloaf, Luzerne Co, PA. He was buried on 21 Mar 1966 in Conyngham Union Cemetery, Conyngham, Luzerne Co, PA.
Wallace resided in 1930 in Butler Ave, Conyngham, Luzerne Co, PA. He worked as truck driver - lumberman in 1930. 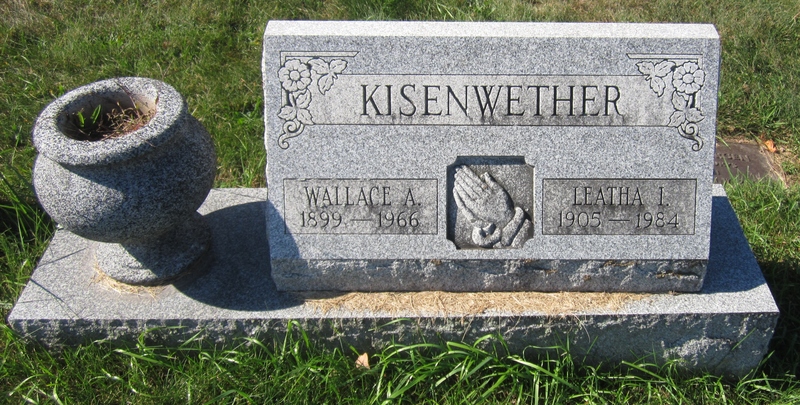 + 10190 F i Leatha N KISENWETHER was born on 18 May 1927. She died on 19 Sep 1996. + 10191 F ii Shirley KISENWETHER. 5359. Harvey W READEMAN [scrapbook] 1 (Ida Susanne SEIWELL , Mary Catherine RUPERT , Susannah H BITLER , James , John , Johannes ) was born on 18 Jan 1906 in Conyngham, Luzerne Co, PA. He died on 24 Apr 1972 in Pocopson Home, West Chester, Chester Co, PA. He was buried on 27 Apr 1972 in Conyngham Union Cemetery, Conyngham, Luzerne Co, PA.
Harvey resided in 1910 in Conyngham, Luzerne Co, PA. He resided in 1930 in 25 W Cranberry Ave, West Hazleton, Luzerne Co, PA. He worked as laborer - odd jobs in 1930. He resided in 1940 in Conyngham, Luzerne Co, PA. He resided in Diamond St, Coatesville, Chester Co, PA. He resided from 31 Jan 1972 to 24 Apr 1972 in Pocopson Home, West Chester, Chester Co, PA. He was a member of Loyal Order Moose, Lodge 202 in Hazleton, PA. He was a member of Tamaqua Fire Company. He was a member of Carpenter's Union. Harvey married Martha VANBLARGAN [scrapbook] 1, 2, daughter of Joseph VANBLARGAN and Mary Ellen LOGAN. Martha was born on 19 Oct 1900 in Oneida, Schuylkill Co, PA. She died on 21 Sep 1970 in Hilltop Manor Convalescent Center, Hazleton, Luzerne Co, PA. She was buried on 24 Sep 1970 in Calvary Cemetery, Drums, Luzerne Co, PA.
Martha resided in 1930 in 25 W Cranberry Ave, West Hazleton, Luzerne Co, PA. She resided in 1940 in 6 S Fifth St, West Hazleton, Luzerne Co, PA. She worked as seamstress - sewing ? & PA in 1940. She was issued a social security number before 1951 in PA. She resided in Sep 1970 in 5 E Broad St, West Hazleton, Luzerne Co, PA.
Miriam Constance READEMAN 1, 2 was born on 4 Jan 1926 in Hazleton Heights, Luzerne Co, PA. She died on 12 Jan 2001. She was buried in Victory Cemetery, Victory, Vernon Co, WI. 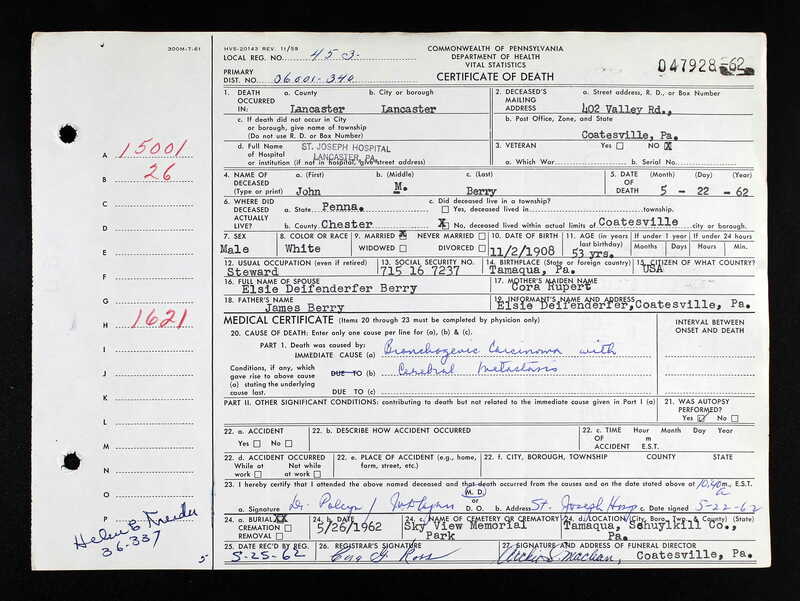 Miriam resided in 1930 in 25 W Cranberry Ave, West Hazleton, Luzerne Co, PA. She resided in 1940 in 6 S Fifth St, West Hazleton, Luzerne Co, PA. She was issued a social security number before 1951 in PA. She resided in Sep 1970 in New York City, NY. She worked as Registered Nurse in Sep 1970. Miriam also married [Male] BINDUS. John H READEMAN [scrapbook] 1, 2 was born on 11 Jul 1927 in PA. He died on 1 Feb 1973. He was buried in Calvary Cemetery, Drums, Luzerne Co, PA.
John resided in 1930 in 25 W Cranberry Ave, West Hazleton, Luzerne Co, PA. He resided in 1940 in 6 S Fifth St, West Hazleton, Luzerne Co, PA. He served in the military with U.S. Army - T5 from 30 Jul 1945 to 15 Jun 1947. He was issued a social security number before 1951 in PA. He resided in Sep 1970 in West Hazleton, Luzerne Co, PA.
5360. Altheda C READEMAN (Ida Susanne SEIWELL , Mary Catherine RUPERT , Susannah H BITLER , James , John , Johannes ). Altheda married John LUSCHYK, son of Alex LUSCHYK and Nellie GILLETA. John was born on 18 Feb 1916 in Berwick, Columbia Co, PA. He died in May 1973 in Hazleton State General Hospital, Hazleton, Luzerne Co, PA. He was buried in Conyngham Union Cemetery, Conyngham, Luzerne Co, PA.
John was issued a social security number before 1951 in PA. He resides in May 1973 in Sybertsville, Luzerne Co, PA. He worked as machinist with Barrett Haentjens and Co. He is a member of Christ United Church of Christ in Conyngham, Luzerne Co, PA. He was a member of Sugarloaf Fire Company. + 10194 F i Rosalind C LUSCHYK. 10195 M ii Richard J LUSCHYK. 5361. Phyliss C DERR 1 (Lillian Amanda SEIWELL , Mary Catherine RUPERT , Susannah H BITLER , James , John , Johannes ) was born on 1 Jan 1907 in PA. She died in May 1987 in Hazleton, Luzerne Co, PA. She was buried in 1987 in Sec 4, Mountain View Cemetery, West Hazleton, Luzerne Co, PA.
Phyliss resided in 1920 in 1038 Locust St, Hazleton, Luzerne Co, PA. She was issued a social security number before 1951 in PA.
Phyliss married John HIGGINS Sr 1, son of HIGGINS. John was born on 14 Feb 1906 in PA. He died in Dec 1980 in Hazleton, Luzerne Co, PA.
John was issued a social security number before 1951 in PA Training School, Elwyn, Delaware Co, PA.
+ 10196 F i Phyliss HIGGINS was born on 8 May 1927. 10197 F ii May HIGGINS. John J HIGGINS Jr 1, 2 was born on 21 Jun 1928 in Hazleton, Luzerne Co, PA. He died on 1 Jan 1999 in Davis Nursing Home, Mountaintop, , PA. He was buried on 5 Jan 1999 in Mountain View Cemetery, West Hazleton, Luzerne Co, PA.
Sonny served in the military with U.S. Army - Private First Class in Korea. He received a military award of Purple Heart. He was a member of Veterans of Foreign Wars. He was a member of Faith United Church of Christ (charter member) in West Hazleton, Luzerne Co, PA. He worked as Bartender. He was a member of Hazleton Owls Rod and Gun Club (honorary member). He resided in Jan 1999 in 710 North St, West Hazleton, Luzerne Co, PA.
Sonny married Blanche B WOREK 1, daughter of Michael WOREK and Josephine CYRAN. Blanche was born about 1924 in PA. She died on 10 Feb 1995. 10199 F iv Jean HIGGINS. Phyliss also married Francis J STERBA "Frank" 1, son of S MORZELAK. Frank was born on 21 Sep 1906 in Hazleton, Luzerne Co, PA. He died in May 1987. He was buried in May 1987 in Sec 4, Mountain View Cemetery, West Hazleton, Luzerne Co, PA.
Frank was issued a social security number before 1951 in PA.
5366. Ray Samuel SEIWELL Sr 1, 2 (Elick Devese SEIWELL , Mary Catherine RUPERT , Susannah H BITLER , James , John , Johannes ) was born 3, 4 on 9 Jan 1918 in PA. He died on 4 Mar 1964 in Baltimore, MD. He was buried on 9 Mar 1964 in Plot O 0 36, Baltimore National Cemetery, Baltimore, MD. Ray resided in 1920 in 1310 Webster St, Bay City, Bay Co, MI. He resided in 1930 in 900 Wilson St, Bay City, Bay Co, MI. He served in the military with U.S. Army, PFC on 18 Jun 1942. He resided in Sep 1962 in Baltimore, Baltimore Co, MD. Ray married Anna Theresa HUG, daughter of Roy Herman HUG and Anna Theresa FINNEGAN, on 6 Sep 1942. Anna was born on 21 Sep 1921 in Baltimore, MD. She died on 30 Jan 1989 in Baltimore, MD. She was buried on 2 Feb 1989 in Plot O 0 36, Baltimore National Cemetery, Baltimore, MD. Anna was issued a social security number before 1951 in MD. + 10200 F i Anna Theresa SEIWELL. 10201 M ii Ray Samuel SEIWELL Jr.
+ 10202 M iii James William SEIWELL. + 10203 F iv Rita Marie SEIWELL. 10204 M v John Elick SEIWELL. + 10205 F vi Betty Lee SEIWELL. 5369. Joseph H RITZ 1 (Lettie May RUPERT , James Alexander RUPERT , Susannah H BITLER , James , John , Johannes ) was born on 7 Oct 1909 in PA. He died on 21 Feb 1993 in Luzerne Co, PA. He was buried in Conyngham Union Cemetery, Conyngham, Luzerne Co, PA.
Joseph resided in 1910 in S Labordite St, Wilkes-Barre, Luzerne Co, PA. He resided in 1940 in 517 E Chestnut St, Hazleton, Luzerne Co, PA. He worked as laborer - radio store in 1940. He was issued a social security number before 1951 in PA.
Joseph married Irlda Virginia FAUX 1, daughter of Ezra W FAUX and Mary J HORN. Irlda was born on 28 Feb 1916 in Conyngham, Luzerne Co, PA. She died on 15 Sep 2004 in Hazleton General Hospital, H Hazleton, Luzerne Co, PA. She was buried in Conyngham Union Cemetery, Conyngham, Luzerne Co, PA.
Irlda graduated from West Hazleton High School. She was issued a social security number . She resided in 1940 in 517 E Chestnut St, Hazleton, Luzerne Co, PA.
10206 M i Darwin Harry RITZ. 10207 M ii Joseph R RITZ. 10208 M iii Floyd RITZ. 5374. John M T BERRY [scrapbook] (Cora Elmira RUPERT , Joel Elmer RUPPERT , Susannah H BITLER , James , John , Johannes ) was born on 2 Nov 1908 in Tamaqua, Schuylkill Co, PA. He died on 22 May 1962 in St Joseph's Hospital, Lancaster, Lancaster Co, PA. 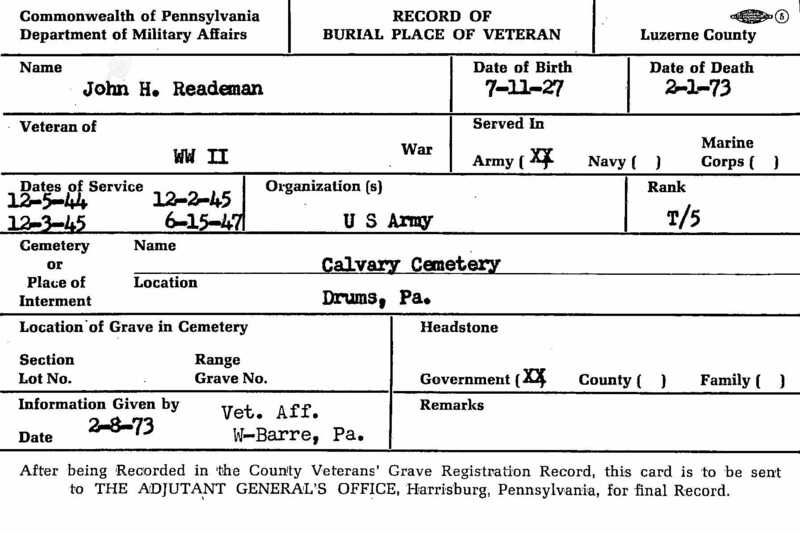 He was buried on 26 May 1962 in Sky View Memorial Park, Hometown, Rush Twp, Schuylkill Co, PA.
John resided in 1920 in 505 Rolling Mill Ave, Tamaqua, Schuylkill Co, PA. He resided in 1940 in 219 Brown St, Tamaqua, Schuylkill Co, PA. He worked as machinist helper with Reading Company shops in 1940. He resided in May 1962 in 402 Valley Rd, Coatesville, Chester Co, PA. He worked as steward in May 1962. John married Elsie DIEFFENDERFER in 1911/1930 in Schuylkill Co, PA. Elsie was buried in Sky View Memorial Park, Hometown, Rush Twp, Schuylkill Co, PA.
Elsie resided in May 1962 in Coatesville, Chester Co, PA.
10209 F i Evelyn BERRY. 10210 F ii Gloria BERRY. 5375. Beatrice S BERRY 1 (Cora Elmira RUPERT , Joel Elmer RUPPERT , Susannah H BITLER , James , John , Johannes ) was born on 20 Apr 1911 in Tamaqua, Schuylkill Co, PA. She died on 25 Jun 1992 in Lebanon, Lebanon Co, PA. She was buried in St Gertrudes Cemetery, Lebanon, Lebanon Co, PA.
Beatrice was issued a social security number before 951 in PA. She resided in 1920 in 505 Rolling Mill Ave, Tamaqua, Schuylkill Co, PA. She resided in 1930 in 223 Brown St, Tamaqua, Schuylkill Co, PA. She worked as machine operator - silk mill in 1930. She resided in Jun 1992 in 28 Lehman St, Lebanon, Lebanon Co, PA. She was a member of Gertrude Catholic Church in Lebanon, PA.
Beatrice married Jerome J COONON 1, 2 in 1931/1950 in Schuylkill Co, PA. Jerome was born on 21 Apr 1910. He died on 12 Dec 1982 in Lebanon, Lebanon Co, PA. He was buried in St Gertrudes Cemetery, Lebanon, Lebanon Co, PA.
Jerome was issued a social security number in PA.
+ 10211 F i Phylis J COONON was born on 5 Jun 1932. She died on 22 Jan 2008. 10212 M ii Jerome COONON. Joan M COONON [scrapbook] 1 was born on 18 Feb 1938. She died on 26 Nov 1997 in Fredericksburg, Lebanon Co, PA. She was buried in Zion Lutheran Cemetery, Jonestown, Lebanon Co, PA.
Joan was issued a social security number in 1952/1954 in PA. She resided in Jun 1992 in Fredericksburg, Lebanon Co, PA. She resided in Nov 1997 in Fredericksburg, Lebanon Co, PA.
Joan married Joseph J HOLLER Jr before 1968. Joseph was born on 7 Mar 1937. He died in Feb 1977. Joseph was issued a social security number in 1954/1955 in PA.
Joan also married Robert A SMITH. Daniel James COONON [scrapbook] 1 was born on 17 Jan 1943 in Lebanon Sanitarium, Lebanon, Lebanon Co, PA. He died on 8 Oct 1968 in Quang Nam, Vietnam. He was buried in Sec Y, Mount Lebanon Cemetery, Lebanon, Lebanon Co, PA.
Daniel served in the military with U.S. Marine Corps, Captain (navigator, F4-B) in Sep 1961 in Vietnam. The cause of his death was Killed in Action. 10215 F v Kathleen M COONON. Kathleen married Keith R UMBERGER. 5376. Geraldine G BERRY (Cora Elmira RUPERT , Joel Elmer RUPPERT , Susannah H BITLER , James , John , Johannes ) was born on 8 Nov 1913 in PA. She died on 12 Aug 1970. She was buried in Sky View Memorial Park, Hometown, Rush Twp, Schuylkill Co, PA.
Geraldine resided in 1920 in 505 Rolling Mill Ave, Tamaqua, Schuylkill Co, PA. She resided in 1930 in 223 Brown St, Tamaqua, Schuylkill Co, PA. She resided in 1940 in Jacksons, Mahanoy Twp, Schuylkill Co, PA. She was a member of St. Paul's UCC in Summit Hill, Carbon Co, PA.
Geraldine married Wilbur Carl SCHLEMMER 1, son of Phillip F SCHLEMMER and Hilda HORN, in 1931/1950 in Schuylkill Co, PA. Wilbur was born on 8 Nov 1911 in PA. He died on 12 Jun 1970. He was buried in Sky View Memorial Park, Hometown, Rush Twp, Schuylkill Co, PA.
Wilbur resided in 1940 in Jacksons, Mahanoy Twp, Schuylkill Co, PA. He worked as salesman - retail grocery in 1940. He was issued a social security number before 1951 in PA. He served in the military with U.S. Army in WW II. He was a member of St Paul's UCC in Summit Hill, Carbon Co, PA.
WIlbur Philip SCHLEMMER was born on 13 May 1935 in PA. He died on 7 Jan 2006. He was buried in Sky View Memorial Park, Hometown, Rush Twp, Schuylkill Co, PA.
WIlbur resided in 1940 in Jacksons, Mahanoy Twp, Schuylkill Co, PA. He served in the military with U. S. Army - PFC. He was confirmed a member of the St. Paul's U.C.C. church on 28 Mar 1948 in Summit Hill, Carbon Co, PA. He was issued a social security number before 1951 in PA. He resided in 2006 in Summit Hill, Carbon Co, PA.
5383. Joan I WILLING (Beatrice A RUPERT , Joel Elmer RUPPERT , Susannah H BITLER , James , John , Johannes ). Joan married Robert Maurice GERBER "Bob", son of Maurice GERBER and Lorraine OSENBACH. Bob was born about 1939 in Coaldale, Schuylkill Co, PA. He died on 16 Aug 1995 in Bergan Mercy Medical Center, Omaha, NE. Bob resides in Tamaqua, Schuylkill Co, PA. He served in the military with U.S. Army from 1957 to 1960. He resides in Bethlehem, Northampton Co, PA. He was a member of Ancient Accepted Scottish Rite Lodge Council and Consistory, Valley of Allentown. He resides in Aug 1995 in 16090 Oak St, Omaha, NE. He worked as business analyst with Mutual of Omaha (Insurance) in Aug 1995. He is a member of Advent United Church of Christ in Omaha, NE. 10219 M i Scott GERBER. 10220 M ii John GERBER. 5384. Edna P RUPERT 1, 2, 3 (Edwin Emanuel RUPERT , Francis Grant RUPERT , Susannah H BITLER , James , John , Johannes ) was born on 25 Mar 1921 in Bloomsburg, Columbia Co, PA. She died on 11 Nov 2014. Edna resided in 1930 in North Union Twp, Schuylkill Co, PA. She resided in Aug 2003 in Zion Grove, North Union Twp, Schuylkill Co, PA.
Edna married Lloyd D VANBLARGAN 1, 2, 3, 4, son of Daniel VANBLARGAN and Mabel, in 1931/1950 in Schuylkill Co, PA. Lloyd was born on 4 Jan 1918 in Nuremberg, North Union Twp, Schuylkill Co, PA. He died on 24 Jun 2002 in At Home, Shenandoah, Schuylkill Co, PA. He was buried on 28 Jun 2002 in Nuremberg Cemetery, North Union Twp, Schuylkill Co, PA.
Lloyd served in the military with U.S. Army in WW II. He served in the military with U S Army - Warrant Officer? on 14 Mar 1941. He was issued a social security number before 1951 in PA. He worked with Alcoa. He resided in Jun 2002 in 25 E Coal St, Shenandoah, Schuylkill Co, PA.
10221 M i Curtis VANBLARGAN. 10222 M ii Wayne VANBLARGAN. 5388. Roy C RUPERT 1, 2, 3 (Edwin Emanuel RUPERT , Francis Grant RUPERT , Susannah H BITLER , James , John , Johannes ) was born on 19 Apr 1929 in Zion Grove, North Union Twp, Schuylkill Co, PA. He died on 3 Oct 2008 in Zion Grove, North Union Twp, Schuylkill Co, PA.
Roy resided in 1930 in North Union Twp, Schuylkill Co, PA. He graduated from Nuremberg High School. He served in the military with U.S. Army - Sergeant. He worked with Bethlehem Steel Corporation. He resided in Aug 2003 in Zion Grove, North Union Twp, Schuylkill Co, PA.
10223 M i Edward RUPERT. 10224 M ii Kenneth RUPERT. 10225 M iii Dennis RUPERT.